David Carr, who died in February, was the media columnist for The New York Times and one of the most important voices in journalism. 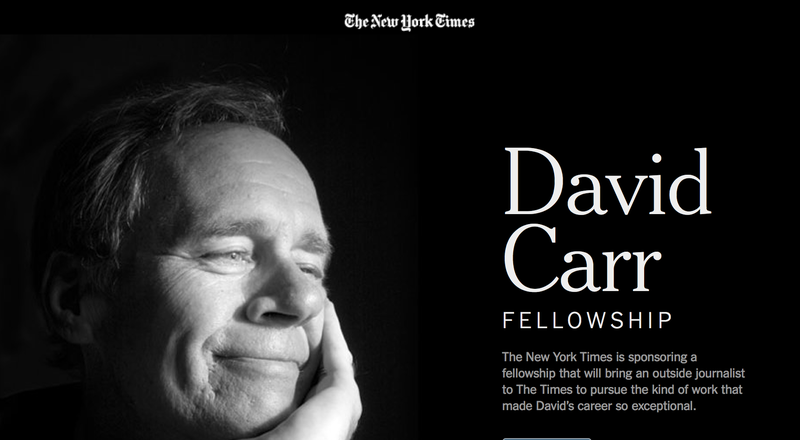 The first David Carr Fellow will spend two years at The Times doing work in the spirit of David’s. The focus of the fellow’s work could be steady, sustained news stories; magazine-style features; investigative efforts; videography; or a mix of approaches, depending on the interests of the fellow and the recommendation of Times editors. David’s work focused on the intersection of media, tech and culture, but the Carr Fellow need not be limited to those fields of interest. The fellowship is an opportunity for a journalist still fairly early in his or her career to build upon David’s commitment to holding power accountable and telling engaging, deeply reported stories. Candidates should have at least three years of experience and be eager to experiment with creative ways of storytelling through video, text, social media and other means. Journalists with experience of all types are welcome, especially those from digital and new media. The Times wants the David Carr Fellow to be selected from a diverse group of candidates, so journalists of all backgrounds are encouraged to apply. The deadline for applications has been extended to Dec. 1, and the fellowship will begin in early 2016. The fellow will receive a competitive compensation package with benefits. David demonstrated a sophisticated understanding of how the convergence of technology and media is reshaping business and culture. Applicants should have some fluency in that subject, but mostly should exhibit a deep curiosity about the changing media landscape and an eagerness to find compelling and human stories that illuminate it. David began his journalistic career with alternative weekly papers. He embodied the frankness, enthusiasm, skepticism and outrage of the best reporters. He was a finalist for the Pulitzer Prize in 2015 for his weekly “Media Equation” column that chronicled the rapidly changing media landscape. David was a passionate and voracious consumer of media of all kinds. He gained a substantial following on social media, especially Twitter; wrote a memoir, “The Night of the Gun”; and starred in “Page One,” a documentary about The Times. A strong advocate for young writers, David last year began teaching a course at Boston University’s school of communications. This fellowship honors his commitment to mentoring talented young journalists and his unwavering belief in the future of the profession.